Moscow’s caution toward Beijing is reflected in its 2013 foreign policy doctrine, which calls for “a strategic partnership” with India, but for “strategic collaboration” with China. For better or worse, China is still several decades of development away from claiming the mantle of the world’s most powerful nation, according to Asia’s wisest living statesman, Lee Kwan Yew, the founder of modern Singapore. The Kremlin should use this “grace period” to allocate resources and introduce incentives to spur economic and demographic growth east of the Urals so that this region doesn’t become what Russian political scientists describe as “a raw materials appendage” to China. The International Monetary Fund and US National Intelligence Council are betting, respectively, that China will overtake the United States economically in 2016 and 2030. Meanwhile, China’s growing strength is causing a geopolitical realignment, with national leaders across the post-Cold War world scratching their heads over how to maximize benefits and minimize costs associated with the rise of the Middle Kingdom. Russia’s President Vladimir Putin is no exception, of course. He will have an opportunity to personally advance Russia’s interests vis-à-vis Beijing when the general secretary of the Communist Party of China (CPC), Xi Jinping, who is also set to become the president of China this week, visits Russia later this month. Russia is the first country President Xi will visit. In keeping with the norm for Russian-Chinese summits, the two leaders will probably announce new bilateral economic deals and reiterate consensus on a number of international issues. This consensus reflects the current convergence of Russian and Chinese interests in counterbalancing US dominance, preserving the UN Security Council’s monopoly on authorizing use of force, and preventing regime change in countries where they have vested interests. The two nations also stand to benefit from further development of bilateral trade, which totaled $83 billion last year, making China Russia’s largest trading partner.If the price is right, then Russia will be happy to help China meet its demand for gas, which is expected to quadruple by 2030, especially given that European states seek to lessen dependence on supplies from Russia’s state-run energy giant Gazprom. 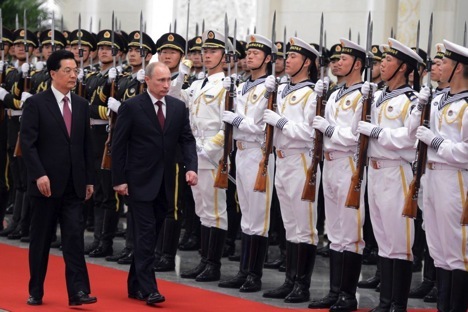 China is also one of the most generous clients of Russia’s defense industry, whose existence is key to preserving Russia’s relative self-sufficiency in armament, but also to maintaining some semblance of diversification of the national economy, which is dominated by the energy sector. However, the rise of China is not without costs for its neighbors. And these costs are bound to increase for the Kremlin not only in Russia itself, but also in the post-Soviet neighborhood, unless Russian leaders address the growing inequalities in the relationship with its economic superpower neighbor. As of 2011, China had a population of 1.344 billion and its GDP totaled $7.3 trillion, ranking second in the world, while Russia had a population of 142 million and its GDP totaled $1.86 trillion, ranking ninth in the world, according to the World Bank. If measured in terms of purchasing power, China’s GDP is to exceed Russia’s by a factor of five in 2013 and a factor of six in 2017, according to the IMF forecast. More recently, the commander of the Russian navy, Vladimir Vysotsky, warned that in the Arctic “a host of states ... are advancing their interests very intensively, in every possible way, in particular China.” In response, “the ships of the Northern and Pacific fleets are continuing to increase their military presence in the Arctic zone,” the admiral said in October 2010. It would be surprising if Russian generals were not planning for a possible conflict with China, which the Economist magazine forecasts to become the world’s largest military spender in 20 years’ time and which has been involved in 23 territorial disputes since 1949, using force in six of them (including the 1969 conflict with Soviet Russia), according to a count by MIT researcher Taylor Fravel. 3,600-km border – once described by Henry Kissinger as a “strategic nightmare” – in a 2004 agreement.Rather, China’s influence in the Far East and Siberia – which some Russian scholars fear may eventually lead to a de facto loss of Russia’s sovereignty over these regions – will expand incrementally and by economic means. Among the factors increasing the risk of such a development, it is the cross-border demographic and economic disparities that should be of utmost concern to the Russian leadership. There are fewer people living in all 27 provinces that comprise Russia’s Urals, Siberian and Far East federal districts than in Heilongjiang, just one of the four Chinese provinces bordering Russia. And all four of the Chinese border provinces have significantly greater population density than Russia's eastern regions. The population density in Heilongjiang, Inner Mongolia, Xinjiang and Jilin is, respectively, 84, 20, 12 and 146 people per square kilometer, according to the China Internet Information Center. In comparison, Russia’s 2010 national census registered a population density of 6.6, 3.7 and 1 person per square kilometer, respectively, in the Urals, Far Eastern and Siberian districts. Neither are the economic comparisons of these border lands in Russia’s favor.In 2010, the regional domestic products of Russia's three eastern federal districts totaled roughly $372 billion, compared with $538 billion worth of goods and services produced by the aforementioned four Chinese provinces over the same period of time. While deepening its economic ties with China, Russia should also tap into the economic potential and modernization know-how of the United States, the European Union, Japan, South Korea and other powers to ensure a diversification of partnerships needed for sustainable development of its eastern provinces.